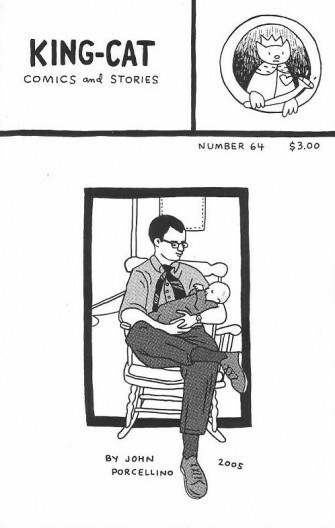 Re-reading the issue of King-Cat cartoonist John Porcellino dedicated to his then-recently deceased father Charles, what's most heartbreaking about it is how unformed and not very slick the end result turns out to be. It's the comics and writing equivalent of a graveside eulogy delivered in a halting voice with several stops and starts. Some of the material pertains directly to the late Porcellino patriarch, some of it seems to be standard King-Cat material that one can't help but read as a tribute to the support the cartoonist received from his dad -- even if that's not the intent at all. Most of the direct memories come in the prose, not the comics, and the anecdotes are well-told in a matter-of-fact voice. Particularly affecting is how Porcellino sees the influence his father had on his career from a vantage point years later, such as in bringing him copies of the Reader and its alt-weekly cartoon mainstays Matt Groening and Lynda Barry. The tenderness of the relationship they had when both were adults is underplayed, the way Porcellino's father remained his father during the hard decisions and choices and second chances that come well after the child is trundled off to college. Mostly this issue feels like something the artist fought to get through rather than settled into with a plan, and that makes the deceased seem that much more present than a slicker effort would have. A very memorable recent comic book.